The other day, as I was sitting in Les Schwab's tire center, I started to feel really irritated. For one thing, the man sitting next to me kept sniffing, loudly, every five seconds. And when he wasn't doing that, he was wiping his nose across the back of his hand, like a little kid would do!! When he finally noticed that I was staring at him, he stared back. I gave him one of my "famous looks," as The Husband likes to call them, and moved across the room to another seat. Yes, I was cranky. I had stayed up way too late the night before, enjoying vintage stuff on the internet. Hours can go by without me even knowing about it when I'm on such sites as Pinterest, or maybe reading other vintage blogs. So yah, I guess I was lacking in Christmas spirit that day. But then, who wants to sit by some guy sniffing and snorting, and being disgusting? Not me. I really don't care what his problem was, and he couldn't have cared less that he was bothering people, but sheesh dude, use your head!! Or better yet, use a kleenex!! Frankly, my Christmas spirit has been a bit slow to come this year. Way too much mean stuff on the news, and crappy people everywhere stepping on my buzz. I think it's time for me to get up and get going on my holiday joy before the season reaches its end, and I'll be left with that awful feeling of "Hey, I missed out! Christmas is over!!!" No, I don't need that. As the saying goes "been there, done that." Remembering Christmas from my childhood is always a sure fire way to make me happy!!!! 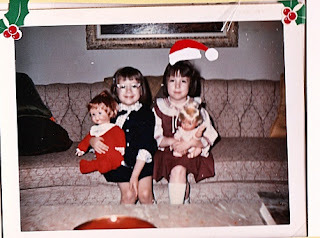 So, join me now for a little peek at some vintage memories from Christmas past. 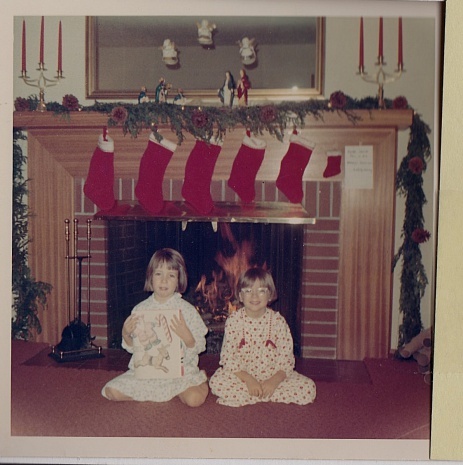 This first photo is my sister Kerry and I in front of the fireplace, on Christmas Eve 1968. I'm the dorky one in the pink glasses! This next one is from 1966. Thats Kerry and I with new Christmas dolls. Again, I'm the dorky one with pink glasses. This one is before my time. I'm not sure of the date, but it was Christmas in the 50's for my three oldest siblings. 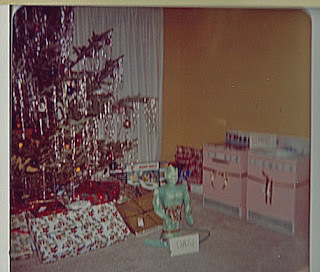 That green monster type toy was for my brother, called The Great Garloo! 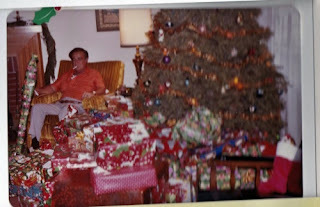 And last but not least, for today that is, we have a photo of my father on Christmas morning, sometime around '82 or '83. He loved Christmas, and it gave him a lot of pleasure to go slightly overboard on the gift giving! From the time I was little until I was grown, I watched him create magic at Christmas. It didn't matter what else was going on in the world, good or bad, he refused to be distracted. Christmas music, decorations, food, and a ton of presents for his family, is what made it a perfect day in his eyes!! Ok, I'm feeling it!!! I think I'll go put on some Christmas music, get a batch of my Grandmothers Chex mix into the oven, make a new "gifts to buy" list and hopefully, list some new items on my web-site!! Don't forget to stop by! !